Cost Effective: It is highly cost savvy and gives efficient and measurable results. For Newspaper insertion in Mumbai, you need to select a venue where you think you’ll best find your target market. It goes without saying that you’re designing of the pamphlet Insertion should be appealing, should convey the right message and create the desire for your product or service within your audience. Time-saving: Unlike other forms of marketing, Newspaper insertion in Mumbaidoesn’t is at all time-consuming task. Once the design and content are printed according to your needs over the night your pamphlets are placed within the designated newspapers you have opted for. Attention seeking: Pamphlets with their textures and colors have always been an attractive thing in a long and boring newspaper. People actually read the pamphlet. It also helps the audience know what you are offering and that being close by they are likely to avail it. That means there is an authentic lead generation that comes in through newspaper insert. Gives Credibility: A pamphlet insertion makes the potential clients aware of your products and service. It gives your brand credibility and authenticity as well. It becomes easy to reach an audience in the easiest and effective way. Unique shapes: Newspaper insert have changed over the years, they are no longer plain, rectangle and text heavy as they used to be. Now they’ve evolved with the designing techniques. Glossy paper, innovative ideas, creative copies, direction to the readers, some appealing call to actions are the base of new pamphlets. These elements actually make the reader look into your content and persuade them to act on it. Having good quality images of the product offerings helps in keeping the audience hooked. Eg: If you own a ice cream parlor give your pamphlet that shape, go the creative way as much as possible. Repetition: Repetition is an art and can be helpful if used in the right way. Pamphlets being cheap in price can be repeated after a specific time interval to a reminder or a hurry-up campaign. Stays insight: Another benefit of inserts is that they don’t go unnoticed. Even after days of them being delivered, they can be read again to know about the business and actually turn the audiences towards you. 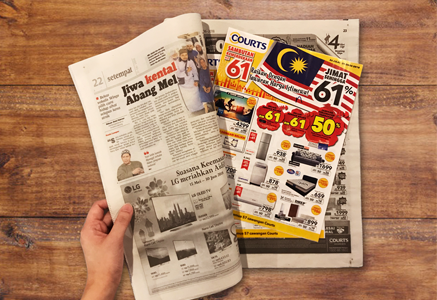 Still in vogue: Printed materials like newspaper and because of newspaper pamphlets can never go out of fashion. There’s a still large chunk of people who are daily newspaper readers, Not just that some households have newspapers of 2-3 languages because the audience is becoming multi-lingual. This also points towards the increasing scope of inserts and why they are still used as a form of marketing. Universal Mediaa specialises in all of the pamphlets insertions, Newspaper insertion in Mumbai. Avail the best cost and quality products from us.